Green Day played the Coastal Credit Union Music Park at Walnut Creek in Raleigh on that stormy night of September 1… If you were there, you were standing in the rain, hoping the show was not canceled due to lightning. The gates did not open until 15 minutes after the opening band Catfish and the Bottlemen was scheduled to go on. So the show was running over 30 minutes late. 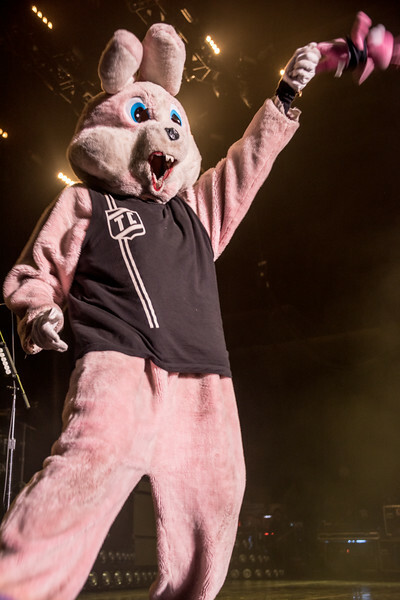 During the stage setup out came Drunk Bunny for a little dance and tossed a couple Drunk Bunny toys out into the crowd. Out comes Green Day playing Know Your Enemy featuring the main members: Billie Joe Armstrong (lead vocals, guitar, piano, harmonica), Mike Dirnt (bass, backing vocals) and Tré Cool (drums, percussion, backing vocals). Into the Know Your Enemy, Billie picks a lady out of the crowd to join the band on stage for Bang Bang. She did not stay around for long as she preformed a stage dive into the crowd. Green Day was formed in East Bay, CA as a Punk Band in 1986 by Billie Joe Armstrong and Mike Dirnt. Originally part of the punk scene at DIY 924 Gilman Street club in Berkeley, CA. Their first major label debut Dookie was released in 1994. Eventually shipped over 10 million copies in the United States alone. Green Day has sold more than 85 million records worldwide. The group has won five Grammy Awards: Best Alternative Albumfor Dookie, Best Rock Album for American Idiot, Record of the Year for “Boulevard of Broken Dreams”, Best Rock Album for the second time for 21st Century Breakdown and Best Musical Show Album for American Idiot: The Original Broadway Cast Recording.